Wow, so bad! 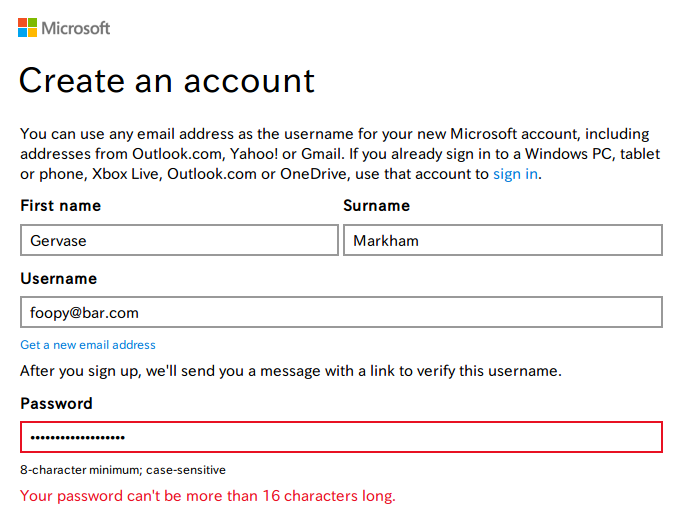 Come on Microsoft, you can do better than that! In related news, bug 1177911. Not particularly related. This is not about having better or worse minimum requirements, it’s about the absurdity of (such low) _maximum_ requirements. The point is, I want to use a secure password, and I _can’t_. That’s not true of BMO. I want to use a secure password, and I _can’t_. That’s not true of BMO. “actors’ frank whisky affadavits” is a secure password. You cannot use this on BMO. What BMO does do nowadays is narrow the space of valid passwords. That’s not good. It does so by imposing some silly restrictions that were a bad idea yesterdecade (because it means that in order to maintain comparable memorability to passphrases like the preceding example, most people are going to end up picking ones that are less secure). I.e., BMO is discouraging secure passwords like the one above in favor of weak stuff like “Kerfuffle9”. That’s not good, either. I just changed my password on my local install of the BMO codebase to “actors’ frank whisky affadavits”. Are you sure that’s not valid? This may belong in the product for Bugzilla proper and not b.m.o; I’m not sure if this is site-specific configuration problem or not. See also: attachment 8626751 from that bug.